In January, my love interest of choice (my boyfriend) and I visited my father in the Philippines. We flew from Reno, Nevada, to Los Angeles, California, to Narita, Japan, where we stayed one night. 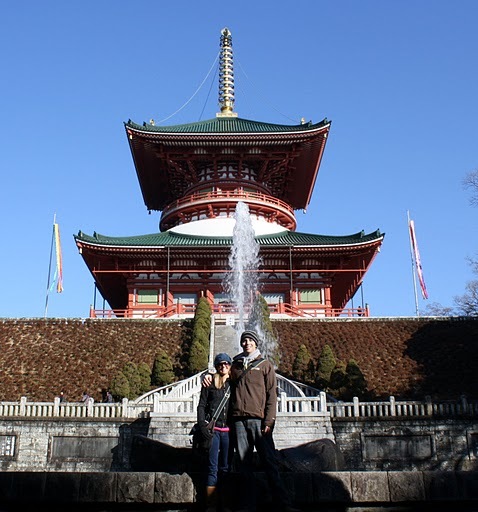 Our 22 hours in Narita proved to be the first of many overseas experiences. We learned that Asia is incredibly fond of Santa Claus. Across the street from our hotel was the “Christmas Carol Inn”, with monuments of Santa and Christmas tress decorating the grounds. This was quite a site both at night and in the daylight. In the morning, prior to returning to the airport, we headed towards a local temple, which we explored for hours. Japan was quite an adventure, one I hope to experience again. We then arrived at the Cebu-Mactan airport. 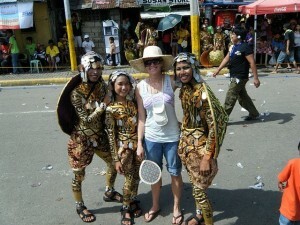 In celebratory fashion, the airport was decorated with Island and party decor, to announce the 2010 Sinulog Festival. This was the main reason we arrived when we did. We got to experience the grand parade, lasting from 8am to 6pm on Sunday morning. For the next nine days my father and his friends showed us around Mactan and Cebu Island, where we got to experience much of the local lifestyle. When traveling, if possible, I recommend stepping outside of the resort grounds and getting a feel for the local community. It is always an eye opening experience, and one that cannot be found in the comforts of maid-up beds and pool sides. This was the first of what I think will be many visits to the Philippines. This particular recap was short, but not to worry, details are to come of my upcoming World Traveling Adventure…Thailand. Johnette on Peru 2015: Cusco Continued.